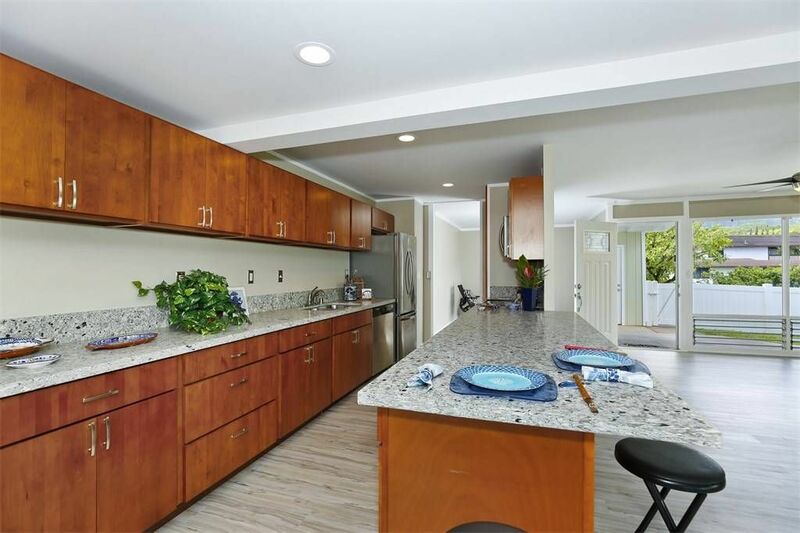 Beautifully renovated home in a wonderful close in Kaneohe neighborhood. Enter the fenced courtyard w/ beautiful flowers & fruit trees, to a front door that opens to a huge Great Room & a newly remodeled kitchen that flows thru French doors to the private back yard, w/ gorgeous mountain views. This home is in move in condition. New drywall & paint, new vinyl plank flooring, new kitchen cabinets, granite counter tops, new bathrooms, new light fixtures, new laundry room & more. There is a bonus area that could be used as a dining room, den, office or children’s play area. The master bedroom is huge – room for a king size bed, dressers & sitting area. There is also an unfinished area that could be an in-law suite or large storage area. Yard is fully fenced. Also a double car garage.